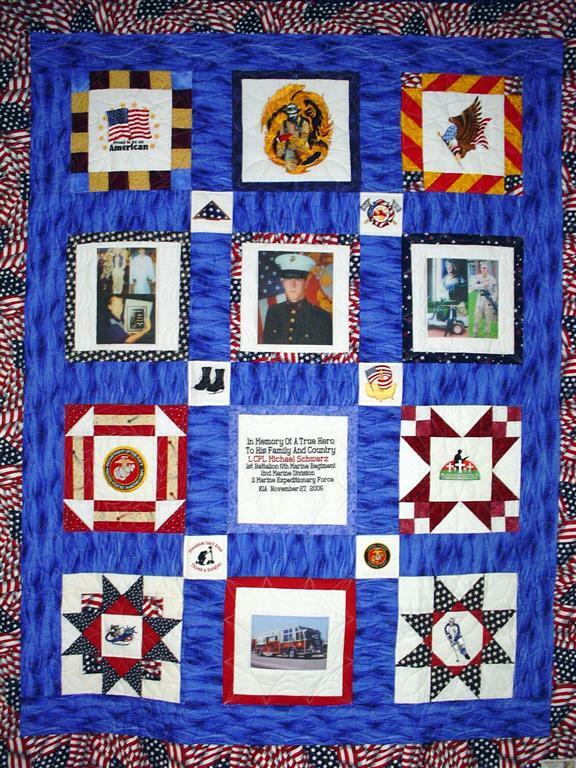 This quilt was made by Freedom Quilts for his family in honor of Marine Lance Cpl. Michael A. Schwarz. ​Hometown: Carldstat, New Jersey, U.S.
Died: November 27, 2006 in Operation Iraqi Freedom. Unit: Marines, 1st Battalion, 6th Marine Regiment, 2nd Marine Division, 2nd Marine Expeditionary Force, Camp Lejeune, NC. Lance Cpl. 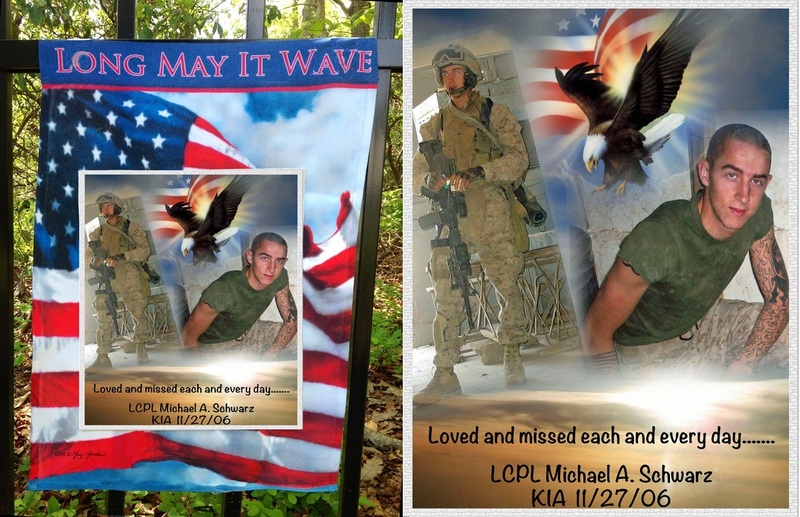 Michael A. Schwarz, 20, of Carlstadt, N.J.; was assigned to the 1st Battalion, 6th Marine Regiment, 2nd Marine Division, II Marine Expeditionary Force, Camp Lejeune, N.C.; He died Nov. 27 from wounds sustained while conducting combat operations in Anbar province, Iraq. 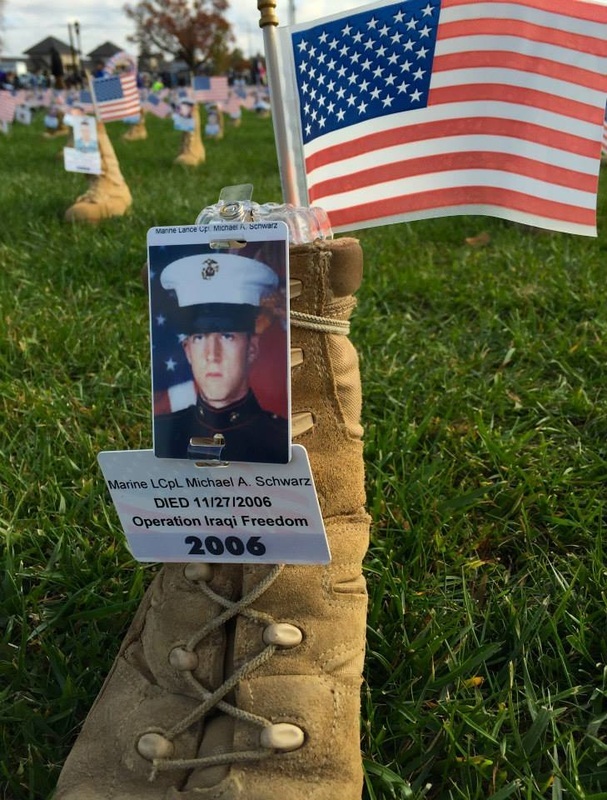 Views: 1,831NorthJersey.com -- CARLSTADT – Even in the deadly context of the Iraq war, Marine Lance Cpl. Michael Schwarz seemed blessed with rare luck. A few weeks ago, a sniper's bullet sliced through the desert air and grazed his helmet, friends said. The 20-year-old Carlstadt resident had already managed to survive nearly three harrowing months in Iraq despite close calls with both shrapnel and gunfire from insurgents. But that luck ran out Monday afternoon, when another sniper's bullet found and killed him in Anbar province, ending in a split second what had been a lifelong dream of serving in the Marine Corps. "It's hard to believe," said Dana Rawinski, 20, one of Schwarz's best friends, wiping her eyes and wearing a red Marines sweatshirt. "I'm waiting for him to come home and laugh at us." As the news spread across this small community of 6,000 that a second son of Carlstadt had fallen in the Iraq war, residents reacted with shock that tragedy had struck so close to home yet again. "You couldn't go anywhere today without seeing someone visibly upset," said Mayor William Roseman. "The community as a whole will grieve over this." In June 2004, Frank T. Carvill, 51, a staff sergeant for the New Jersey National Guard, was killed when his convoy came under grenade and bomb attack. A paralegal for the Port Authority of New York and New Jersey, he had left the World Trade Center a minute before the first plane hit on Sept. 11, 2001. Flags will fly at half-staff this week, Roseman said, and the borough will assist the family in picking up Schwarz's body when it is flown back to the United States, most likely this weekend. The Schwarz family, who declined to speak to reporters Tuesday, is well-known in the community: Michael Schwarz and his older brother, Frank, served in the borough's volunteer fire department, which was headed for years by their father, Kenneth Schwarz. Outside the firehouse Tuesday, the marquee read, "In memory of our brother, LCPL Michael Schwarz, United States Marine Corps." And at Becton Regional High School, from which Schwarz graduated in 2004, officials set up a "crisis team" of counselors to help students with grief, Principal James Jencarelli said. Friends of Schwarz described him as a fun-loving, outgoing kid who was deeply serious about one thing: joining the Marines. "The whole time I've known him, that's all he ever talked about," said East Rutherford resident Sean Tilt, 20, another close friend, who first met Schwarz in middle school. As a young child, Schwarz spoke often of enlisting in the Marine Corps, family friends said, and his resolve only strengthened as he grew older. The events of 9/11 reinforced his determination, Rawinski said. "He always wanted to be a soldier," said Chris Assenheimer, a cousin of Schwarz's father. In high school history class, Schwarz showed interest in this country's military history, said Jim Bononno, a teacher and football coach at Becton. "We spent a lot of time discussing 'Band of Brothers,' " Bononno said of the HBO series that chronicled soldiers of the 101st Airborne Division during World War II. "He liked watching the History Channel." Schwarz set off for Iraq without fear, his friends said, filled with nervous excitement – a member of the 1st Battalion, 6th Marine Regiment, 2nd Marine Division, II Marine Expeditionary Force. 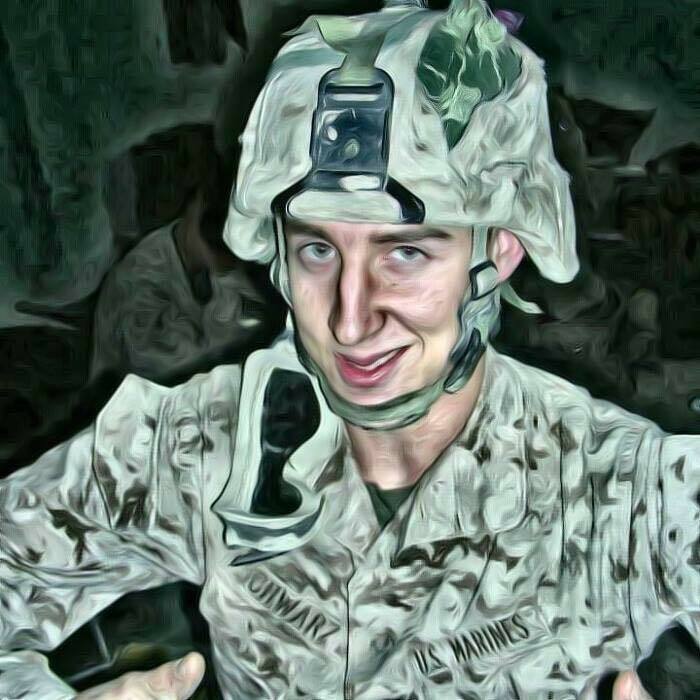 On his MySpace Web page, Schwarz included a clock ticking down to the moment when he would return home from Iraq, and another that counted down to the date he would be discharged from the Marines. The clocks were still running Tuesday. Only Schwarz's passion for off-road driving could rival his desire to join the Marines. He would hop in his customized Jeep and head to the Meadowlands or to Pennsylvania with his older brother and a group of friends for adventures that often ended with busted parts. "He worked on his Jeep all the time," Tilt said. "Usually every time we went out, he broke something." Fortunately, Michael Schwarz was good with cars, following in the footsteps of his father and brother, both auto mechanics. On at least one occasion, Tilt received a call from Schwarz at 2 a.m., wondering if he could pick him up after his Jeep got stuck in the mud during an off-road excursion. "He got along with everybody," Rawinski said. "Besides driving too fast, he never did anything wrong." The two friends saw each other every couple of weeks while Schwarz was stationed at Camp Lejeune, N.C., prior to his deployment to Iraq. Before he left, the friends got matching tattoos: a skull and bones, with a wrench and a gear in the background. She's worn a Marines shirt or sweatshirt virtually every day since he went to Iraq in September. After he enlisted, Schwarz kept in touch with friends in part by posting blog entries to his MySpace page. Just before he was sent to Iraq, he showed some of the bravado that young Marines need to do their jobs. "im a machine gunner and im goin to iraq in sept to ramadi," he wrote. "... well geuss well see how things go peace." Washington, DC – On January 4, 2011, the bill (H.R. 5133) to honor two fallen New Jersey war heroes, introduced by Representative Steve Rothman (D-NJ), was signed into law by President Obama. This law renames the post office in Carlstadt, NJ in honor of the memory of Army Staff Sergeant Frank T. Carvill and Marine Lance Corporal Michael A. Schwarz, both of whom were residents of Carlstadt and died in the Iraq war. 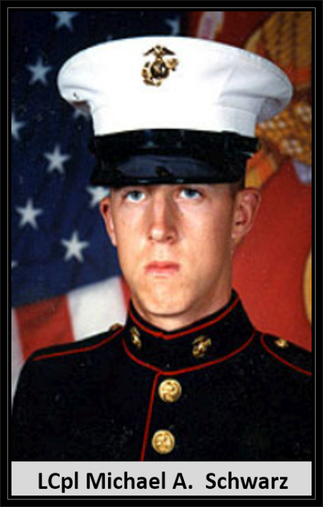 On June 4, 2004, Staff Sergeant Frank T. Carvill was killed when his Humvee was ambushed in Baghdad’s Sadr City district. 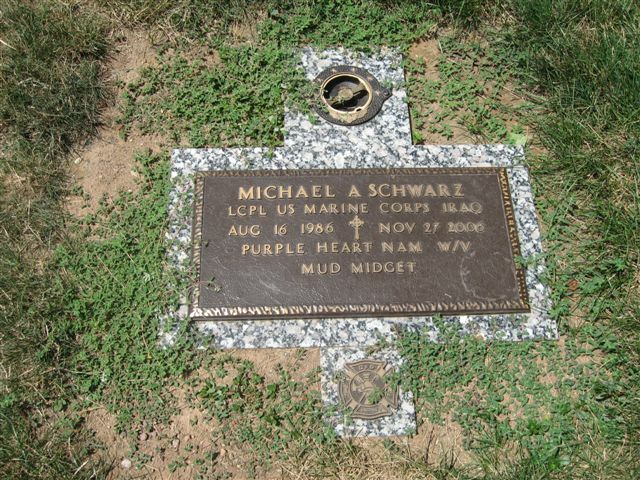 Lance Corporal Michael A. Schwarz was killed by a sniper in Al Anbar province on November 27, 2006.